Toya Wright Instagram’d her ensemble and she styled a colorful bodycon dress with $875 Yves Saint Laurent Patent Leather Tribute Sandals. These patent leather sandals features a rounded open top, T-strap vamp, adjustable ankle strap, lightly padded insole, and a skinny stiletto heel. You can get Toya’s YSL sandals at Farfetch, Neiman Marcus or DSW. I like how Toya matched these shoes with the dress that she’s wearing because it brought out the colors. I also love her new hair color. Blonde streaks mixed with black hair are always a go! Any thoughts? G.O.O.D. 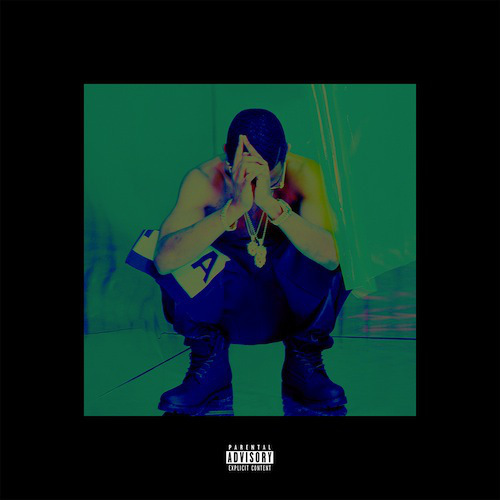 Music’s Big Sean releases his sophomore LP, Hall Of Fame on August 27th. The project serves as the follow-up to Sean’s gold-selling debut, Finally Famous: The Album. The official tracklist was just released and on the album, the Detroit-native grabs Nicki Minaj, Nas, Young Jeezy, Kid Cudi, Jhene Aiko, Ellie Goulding, Jame Fauntleroy, Juicy J, Miguel, Lil Wayne and Payroll of Doughboyz Cashout for the 15-track standard edition. NO I.D., Key Wane and Da Internz handled production duties. 25-year-old media personality, socialite and entrepreneuress Angela Simmons flaunts her beach body in Miami. After hosting the official launch of her new site, AngelaIAm.Com and introducing the launch of the e-Commerce section of her site at NYC’s Henri Bendel, 106 & Park’s summer co-host decided to fly to Miami for a mini vacation. She was photo’d on the beach in a sheer halterneck one-piece bathing suit. Check out this “fly girl” flaunting her body on the beach. 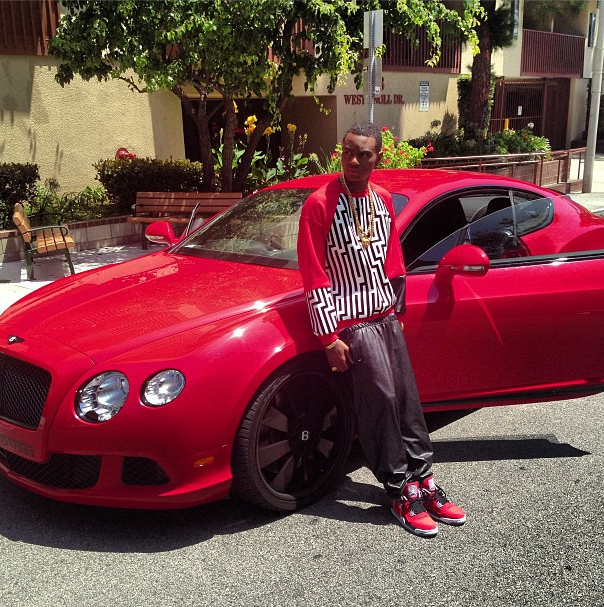 Soulja Boy posed in front and inside of his red Bentley in style. The pictures were taken in Hollywood, California. Soulja styled in a $95 Red Pyramid Sweater by Golden Hanger. 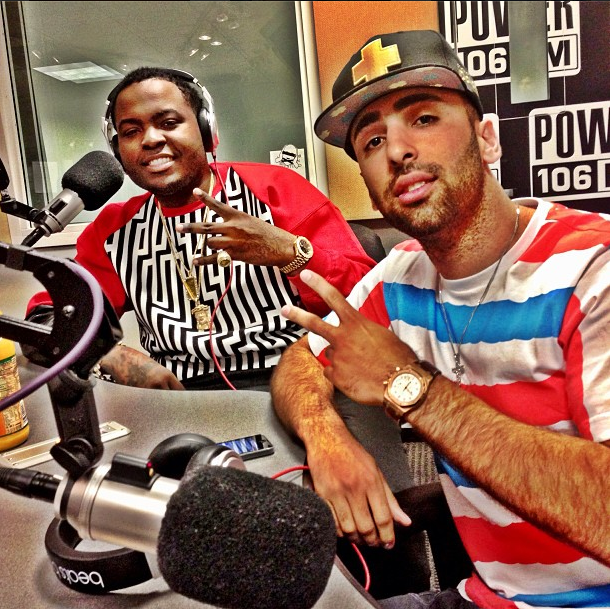 Music artist Sean Kingston also wore this sweater back in March during a radio interview with Power 106. 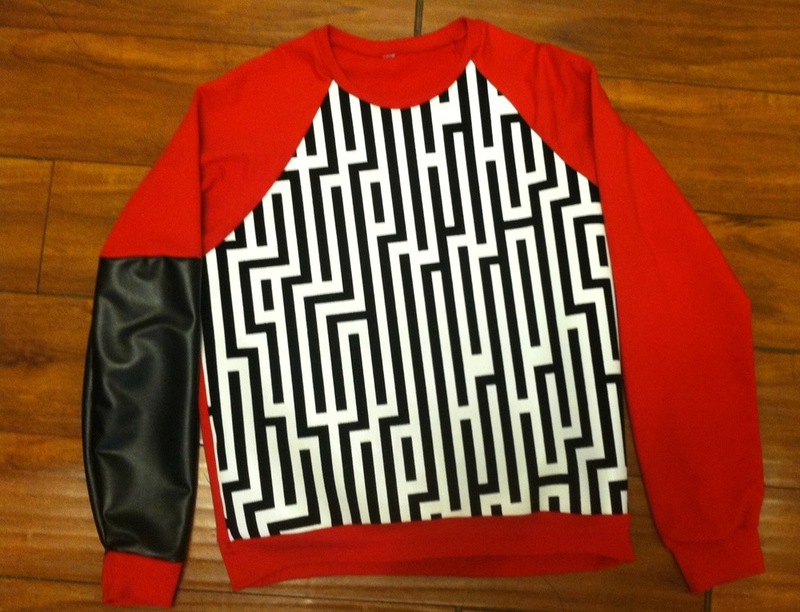 This custom sweater was designed by Henry Spencer and features faux leather detail. Fellas, what are your thoughts on this sweater? Reality star and clothing line owner Draya partied at the Toxic Day Party at Lure in Hollywood. Singer Mya, DJ Mo Beatz, rappers Wale & Soulja Boy, actors Lance Gross & Terrance J, and NBA players Kevin Durant, James Harden & Taj Gibson were also in attendance. For her club appearance, Draya paired a white bustier and daisy dukes shorts with $200 ZIGIny Samara Gladiator Tan Heels. These tan knee-high gladiator inspired heels are a must have for this summer season. Ladies, would you wear these heels? What do you think about Draya’s look? YMCMB’s rapper Lil Twist was photo’d on the West coast in a $78 Rik Villa Ombre Half Time Tee-Shirt paired with the brand’s matching $98 Ombre Bandana Shorts. 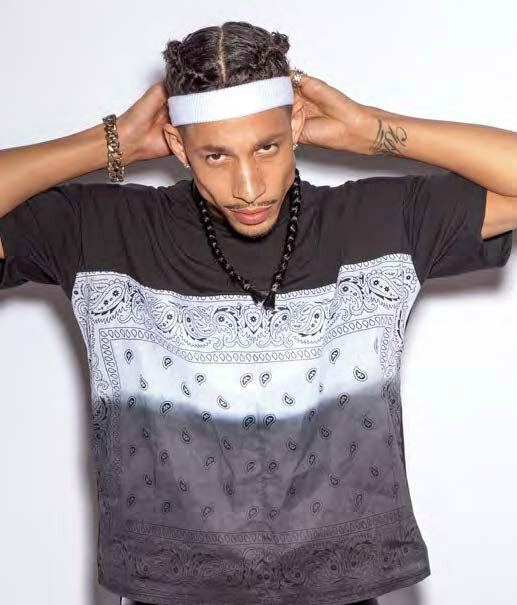 Rik Villa is a Los Angeles-based designer and most of his clothing is made from handkerchief material. Lil Twist is set to release his new single “Twerk” Ft. Justin Bieber and Miley Cyrus, produced Maejor Ali in a couple of weeks. The track will appear on Twist’s new album, Bad Decisions, executive produced by Lil Wayne and Justin Bieber.